One of my favorite techniques for quick outdoor portraits is what I call "Spot Meter Plus Backlight." The set up is simple. Put the sun behind the subject with a clean background. Then adjust your metering pattern to spot meter, take a reading off the subject, and fire away. You'll get nice highlights in the hair, good separation between the subject and background, plus you can work quickly and from any distance. 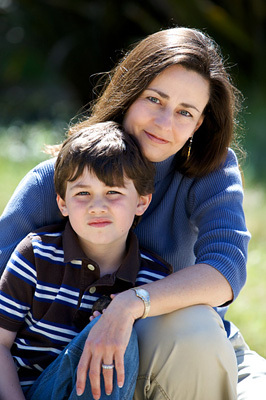 For this quick portrait of Karen and Ethan, I used a Canon 5D Mark II, 70-200mm f/2.8 zoom, and that's it. The aperture was set to f/4, shutter speed 1/350th, and ISO 200. I had the lens extended all the way out to 200mm. I processed the image in Aperture with final touches in Photoshop CS4.